Irvine Berlin memorialized the event in the 1948 musical Easter Parade starring Fred Astaire and Judy Garland, but the New York Easter Parade tradition goes back to a much earlier time. 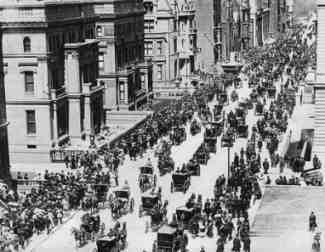 In fact, the Fifth Avenue Easter Parade is a New York phenomenon that dates back to the middle of the 1800s. Back then, the social elite would attend a service at one of the fashionable 5th Avenue churches, such as St. Patrick's Cathedral, and parade down the Avenue afterwards to give onlookers - and each other - a chance to view their new Easter hats and dresses. The less well-to-do would come to gawk at the carriage set, and to see what the latest trends were. Many handy seamstresses found inspiration for their middle class client's wardrobes at the parade. It was a combination of religious services, reality TV, and haute couture in the days before mass media, when only the wealthiest New Yorkers could attend the Paris fashion shows and keep up with the latest trends. The parade takes place on Fifth Avenue from 49th to 57th Streets. The action starts at 10AM and goes on for hours. Join the spectators in the viewing stands or along the streets. While there is still an element of fashion involved in the modern spectacle, the current version tends to be more fantastic. Live birds nest in bonnets of real flowers, while even fashionable pets are dressed in the latest 5th Avenue doggy wear. Today, in New York on Easter Sunday flamboyant headgear and costumes are paraded down 5th Avenue to the delight of onlookers. You don't need a special outfit to join in the fun. Anyone can step out and stroll down the Avenue. Meanwhile, New York weather in early Spring is anything but reliable. "Record April Snowfall, 10 Inches, and 60-Mile Gale Usher in New York's Easter," was a headline in the New York Times on April 4, 1915. While this is unusual, a rainy March or April day can make for soggy bonnet watching. In good years, the weather forecast will call for a wonderful sunny day with temperatures around 60 degrees. If that's the case, you can count on a huge crowd. The song lyrics predict, "On the Avenue, Fifth Avenue, the photographers will snap us and you'll find that you're in the rotogravure." You can dress up for a chance at being caught in the modern version - the TV camera. Who knows, you may find that you're on the evening news. Either way, it's a lot of fun. Happy Easter!